Every summer I find myself favoring a certain style or aesthetic. Last year, I was in love with bright colors and stacked bracelets; a sort of glamorous prep in the spirit of Atlantic-Pacific. This year, those mixed patterns and bright accessories are still on the menu, but the mode du jour is vintage prep, circa 1980s and 1990s. I've always had a soft-spot for preppy classics, like boat shoes and oxford shirts, but I love the idea of adding Ikat patterns or raw, organic fabrics to give an outfit a bohemian twist. For inspiration, I listen to Vampire Weekend, especially their song"Step" which is like watching Ferris Bueller's Day Off for the first time. It's perfect. I stumbled upon this amazing letterman's sweater when I was browsing the kid's section at Goodwill. It was like $5. All wool, made in Boston, and the pockets and vest of the sweater are one piece (I can't even figure out how they did it). It's such a treasure! I found the shorts at the same time. I love the stripes. As a treat for readers, I'm having a sale on everything in my Etsy store! 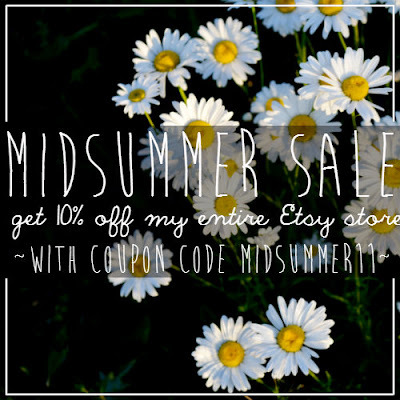 Use the code MIDSUMMER11 to get 10% off your purchase! Hurry! The code expires July 31st. those shorts are lovely and i like the light feel of this outfit! I want that shirt! Let me know if it ever ends up in your Etsy store! You look so beautiful in this letterman jacket- what a steal, too! So jealous that you found such a great quality piece for so cheap! I'm a big fan of "preppy" clothing as well, I'm especially fond of J Crew right now! You look so adorable! This vintage outfit definitely suits you :) Loving the subtle mix of prints too! I loooove mixing prints and seeing how other bloggers do it, you rock ^_^ Adore the shorts! oh my lord, i am now going to cruise through the kid section more often- that sweater is GORGEOUS. i love the thickness of it and the color. and i love this all-preppy look too- those shorts are ah-dorable! There is something very Ferris Bueller-esque about this outfit... maybe it's the sweater? I mean that as a compliment, in case it wasn't clear; to me Matthew Broderick was by far the best dressed person in that movie, except perhaps for Charlie Sheen :) I have to say, I love that you actually embrace certain styles and aesthetics in summer... I just try to get through the season wearing as few clothes as I can reaonsably get away with. Heat is not my thing.